We hear all the time about people selling their stockpiles and the controversy of whether if its legal or not. I’m hoping to clear up some of the questions that come along with, “Is it Legal”? 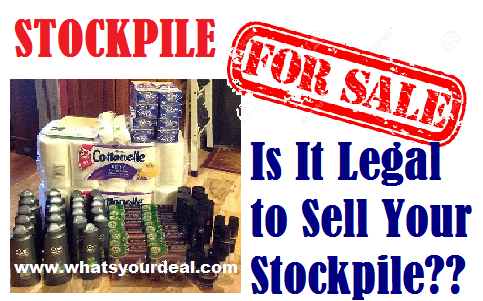 IS IT LEGAL TO SELL YOUR STOCKPILE? YES it is legal to sell your stockpile items. However, DO NOT sell any items that have been recalled or is past their expiration date. Ownership became YOURS when you were at the register and finalized a completely legal purchase. This includes if you purchased the items using coupons, cash, credit cards and even EBT cards. Again, as long as the items were purchased in a legal manner. Ownership of those said items remains solely yours to do with as you see fit. Think about Ebay, Amazon, Craigslist, Yard Sales, Flea Markets, Thrift Stores, Consignment Shops, they wouldn’t exist if it was illegal to sell items that YOU own. DO I HAVE TO REPORT THE MONEY I MAKE FROM SELLING MY STOCKPILE? So whether you do this as a hobby or as a business you would have to file claims once the amount is over $400.00 in a one year time span. IF I DONATE ITEMS CAN I CLAIM THAT ON MY TAXES? YES, and it actually pays to donate. Many charities or local food banks will give you a donation receipt. If they don’t make sure you keep track of your donations. You can claim the retail value of the product (without coupons). If you paid $2.99 for Tide on sale and with a coupon, but regular price is $9.99, you can claim the full amount of the $9.99. WYD / TOO! 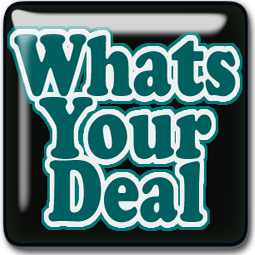 Groups has always supported and taken the stance with the letter of the law with regards to selling your items. The fact that the Supreme Court has made a ruling in this favor of doing just that, we say have fun selling your items and making some money!